Ireland golf itinerary is lead by the legendary courses of the Southwest. With Ballybunion, Dooks plus Tralee among the best links golf courses anywhere. Ireland’s Southwest is the most popular of all Irish golf vacation tours. Arrive Shannon airport and meet your driver/guide. Transfer to Doonbeg Lodge for a 3-night stay. 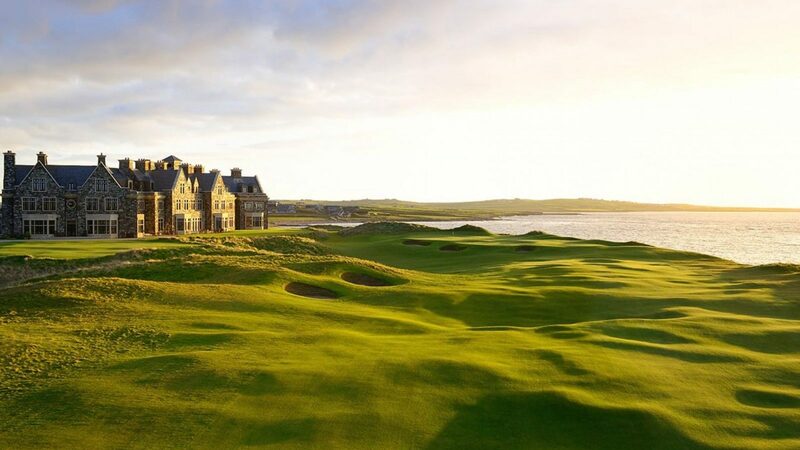 The luxurious 5-star lodge at Doonbeg overlooks a spectacular links course and the Ocean. The Lodge at Doonbeg is the perfect beginning to your Irish golf vacation. The area is also a base from which to visit the Cliffs of Moher, the Burren, Aran Islands and Galway. Play Lahinch Golf Club, situated on the west coast of Clare and naturally shaped by ocean and dunes, Lahinch is Ireland’s insiders favorite. Created by Old Tom Morris in 1892 and transformed by Alister Mackenzie in 1927 this links features a classic design that offers a great deal of variety, including 2 exceptional blind shots. Lahinch was founded 1892. 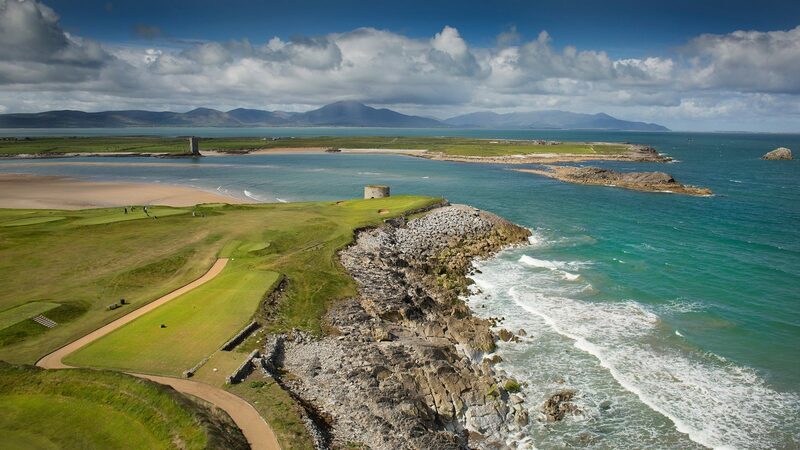 Play Tralee, perched on a cliff overlooking the beautiful Dingle Peninsula, Tralee is one of the most stunning links courses in the world offering many dramatic holes that test the skills of golfers at every level. Tralee was redesigned by Arnold Palmer and has a back nine to equal any. The course was originally founded in 1896. Check-into your new accommodations where you will spend the next 4 nights. Options with stay at traditional Irish bed and breakfast properties to 4 and 5 star hotels are available with all custom designed Ireland golf vacations. Example accommodations include, Dromoland Castle and the Killarney Park Hotel. Play Ballybunion, It’s been said that this course is “nothing less than the finest seaside course ever seen”. One of the finest links courses in the world and in Tom Watson’s opinion; “the graveyard near the first tee gives the golfer an inclination of the sense of mystique and timelessness that is to follow”. Ballybunion was founded in 1893. Play Waterville, this stunning course was fondly dubbed the “Magnificent Monster” by Sam Snead and is located on the Ring of Kerry and buffeted by peninsular winds. One of Europe’s longest courses, Jack Mulcahy and Eddie Hackett transformed this rugged links land into an elegant championship course. Waterville is a favorite of Tiger Woods and was founded in 1973. Play Old Head known as the Pebble Beach of Ireland, in many ways Old Head is more stunning. Set on a peninsula hundreds of feet above sea level with its own micro-climate and ocean views from every hole. After golf activities include a visit to the fishing village of Kinsale and Blarney Castle. Check out of your accommodations. Transfers back to airport are provided by your driver. Depart Ireland and transfer to Shannon Airport for your flight back home. Ireland golf packages are fully customizable! Packages with a private dedicated driver or point to point transfers available.